The coming of the railways changed the little village of Turvey, like it did most villages and towns in Britain. Many new jobs were created and people were able to travel like they never had before. Turvey railway station opened in 1872 and was part of the Bedford and Northampton Railway Company. The first train ran on 10 June 1872. 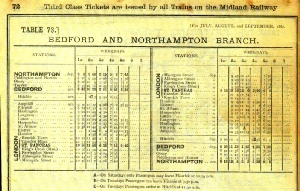 The first timetables show that five trains ran in each direction every day. There were never any Sunday trains. The population of the village rose to 1,117 with the coming of the railways. When 200 'navvies' were sent to Turvey to construct the railway many wondered where the little village would find beds for them all. Mr Charles Longuet Higgins lept into action and had a row of cottages built in Baker's Close for their use. Colonel Higgins of Picts Hill built a working men's room in Bamford's Yard, which he supplied with magazines and newspapers. It was converted from a barn. This was a popular place for evening entertainments and somewhere they could meet of a Sunday. It later housed the Boy Scouts in 1928-35. The three signal men worked shifts. One did 6 am until 2 pm, then there was 2 pm until 10 pm and finally 10 pm until 6 am again. It was important work and quite well paid. Find out more about Train Crashes at Turvey! Turvey still has a railway! It is a 2 ft narrow gauge one and runs for 1.2 km (3/4 of a mile) along the track bed of the old Bedford to Northampton line. It was created by former members of The Surrey Light Railway of Hersham, Surrey in the early 1980s. There is a signal box with a 31 lever Westinghouse ‘L’ frame inside, which was originally from Battersea Park Signal box. The railway is privately owned but can be seen from the public right of way that runs down the old railway line. 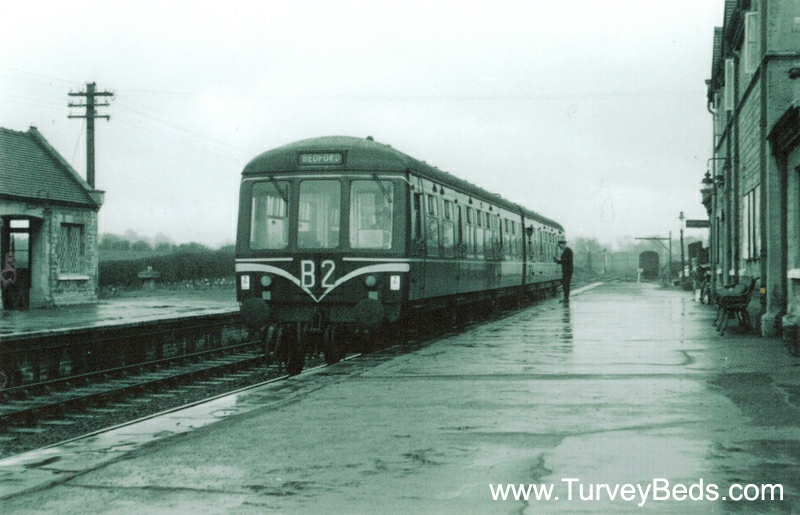 Here is a link to some images of the Stevington and Turvey Light Railway. 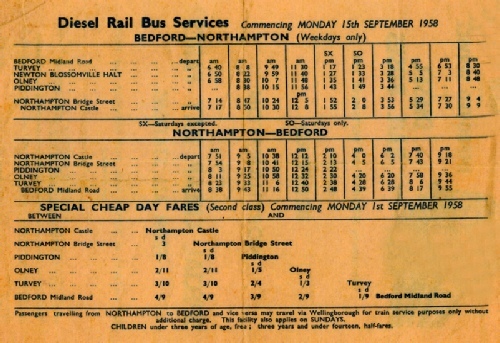 Announcement of the new Diesel Rail Buses from 15 September 1958, and details of the timetable and fares. 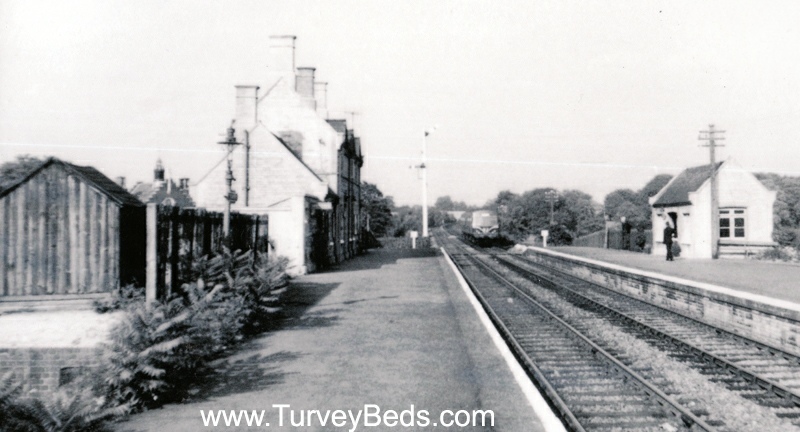 A meeting was held on Friday 19 August 1864, at Olney, to discuss promoting a railway line from Bedford to Northampton, passing through Turvey. Three members of the Higgins family, CL Higgins, TC Higgins and Col. Higgins (the chairman) were all present, as well as Mr Whitbread who owned Turvey Mill. 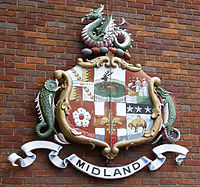 The gentlemen were very concerned that Turvey would be included on the route and that it be operated by the Midland Railway Company. This picture was taken in March 1962 and show one of the very last trains to pass through Turvey Station. 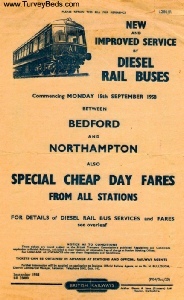 Turvey’s railway died when the Bedford to Northampton line was closed. 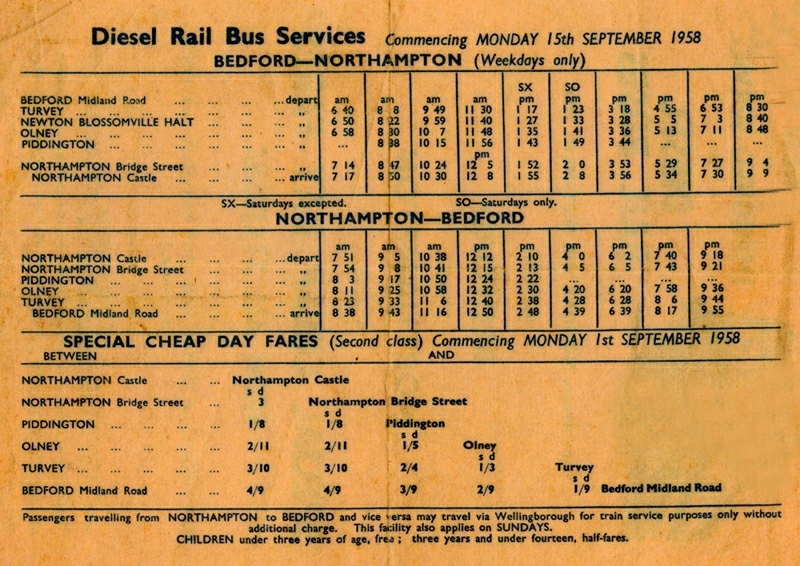 The railway line at Turvey was part of the Midland line that ran from Bedford to Northampton. It was 20 miles long. a day but they were hardly used. Carr Bailey was the Station Master at this time. 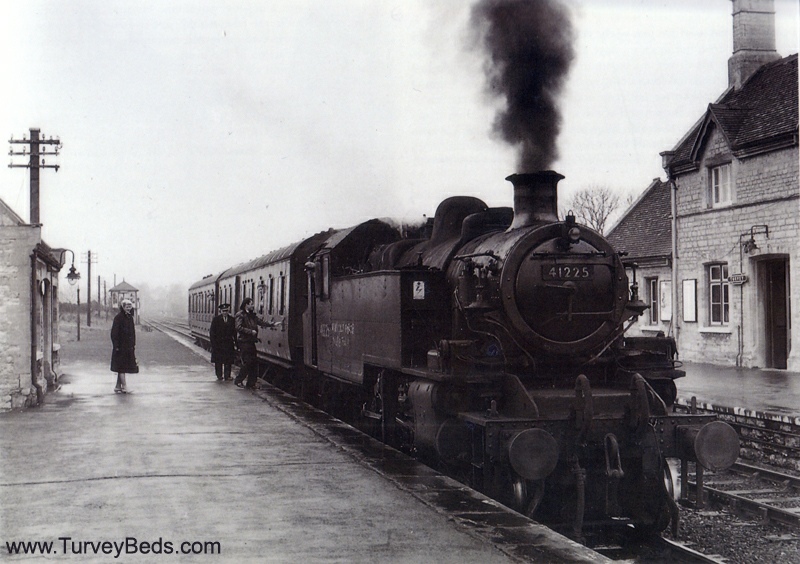 The last passenger train left the station at 9.20 pm on 3 March 1962. 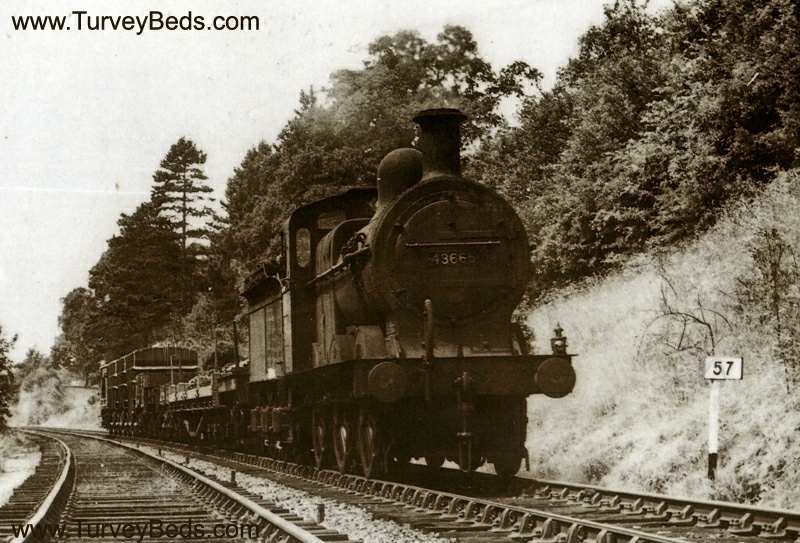 In 1969, Quenby Price the grain merchants moved into the old station buildings and yard. They did not alter the beautiful station but did remove the platforms. This is the lovely Turvey Station building as it was in December 2000. Here is a picture of a diesel rail bus coming through Turvey Station. 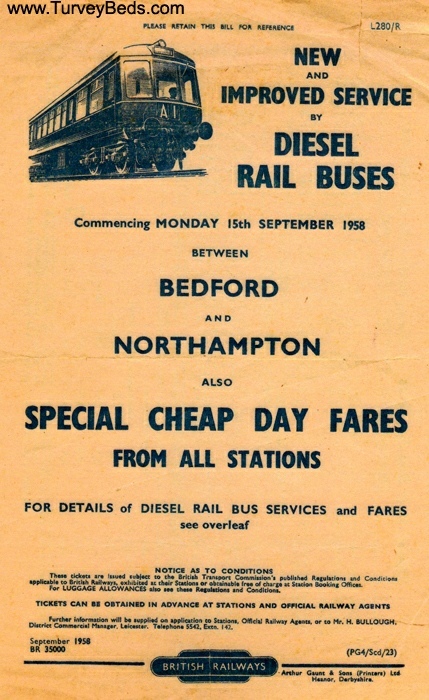 The diesel rail buses began in September 1958. Each bus has 4 wheels and could seat about 40 passengers. The rail cars were economical to run, but not always very reliable. They were introduced to quite a few parts of the UK in the late 1950s, but all withdrawn by the mid 1960s. The line ended its days as it began.. Using steam engines to pull the rolling stock. In August 1940 the line between Olney and Turvey was temporarily closed and used as a storage siding for war materials. 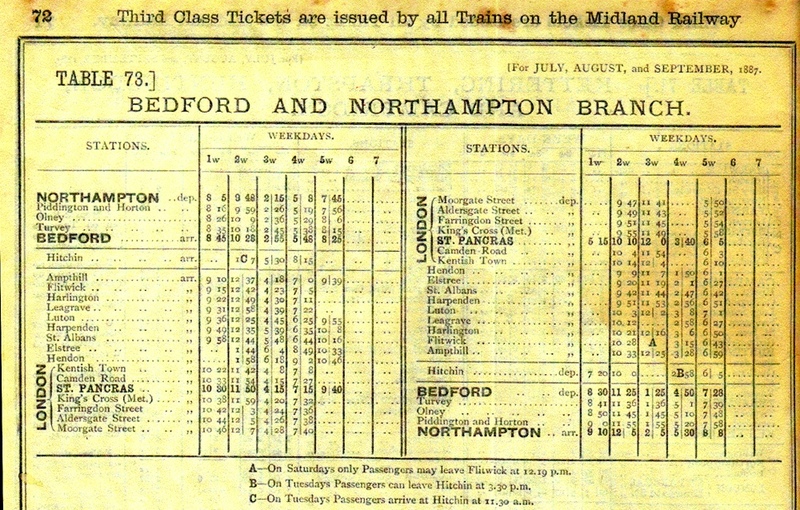 Here is the timetable for July-September 1887. There were 5 trains a day, which linked with the London train. A goods train puffs away from Turvey in the early 1920s. This is a class 2228 0-6-0 tank engine, built in 1900 by the Vulcan Foundry, it was cut up at the Doncaster Works in 1960. From 1908 until 1917 each train consisted of an 0-4-4T tank engine, a driving trailer, and ordinary coach, and another driving trailer at the rear. Driving coaches are coaches with a driver’s compartment built in, from which the train crew can control the engine. This meant the train could run in either direction, and so did not need to be turned around. This is called ‘push-and-pull’ operating. Push-and-pull was reintroduced in the 1950s using larger 2-6-2T engines. Ivatt 2-6-2 class 2MT-A steam locomotive number 41225 with a push-and-pull train in the late 1950s. This engine was built in Crewe in 1948. This particular engine was immortalized in N-guage model form by Dapol (product code ND064A). The three rail buses that operated through Turvey were built at Park Royal. They were numbers 79971-79973.
after its withdrawal from service. It was the subject of an early Airfix OO-scale kit. This was later re-released by Dapol.